Typical Jordanian lunch – hummus with fillings, and bread. The bread is very cheap here because it’s subsidised by the Government. Meet Ruth Sayers, a CMS UK partner working in Amman, who has organised the logistics of my visits in the capital. Amman where I am staying has a population of 2 million in a country of 6 million. The Jordanian people I met are friendly and helpful. Staying with mission partners in the city. Go to the river Jordan, a little under-whelming, reduced to a trickle, although many baptisms are still done in the Jordan. Go to the actual baptism site of Jesus, which is now on dry ground, east of the Jordan river. Visited Mt Nebo, the site where Moses looked out on the Promised Land, where he died and God himself buried Moses there. Visit Jerash, ancient ruins and Adjloun Castle. Jerash included a Roman tutorial on Roman warfare and a chariot race. Shadi, my driver is an Anglican, young, proud, helpful. It seems difficult to carve out a living as a taxi driver, as they are very expensive to buy, there are strict rules on charging cheap fares, and the roads are hopeless resulting in high maintenance costs. Low incomes result. Evening, 5.00pm service at Church of the Redeemer (Episcopal), an English speaking congregation led by an Australian, typical English service. The congregation is mostly ex-pats, maybe 30 in a church that seats 300. Ruth helps me get a taxi there – a case of the blind leading the blind! Church of the Redeemer, Arabic congregation, George Kopti used to be an Assistant Priest here. Fr Fadi Diab is Pastor and helped me robe for the service – fairly typical service except all in Arabic – with a slot to bring a greeting from NZ. Afterwards, I had a cuppa with the congregation. The previous King of Jordan apparently has decreed Christian Unity by insisting they all celebrate the Eastern Easter and the Western Christmas dates. The customs here are interesting; men never embrace women in public, and it is improper to cross your legs. I shared the concept of wae wae tapu – forgiving new people from other tribes who make mistakes with your customs - which seemed to receive some interest. Also “Kia Ora” or “Be Alive”. We did the stations of the cross this morning (starting 5 a.m! ), pilgrims carrying a cross to each station where the events are said to have happened. We had scripture and litany at each station. We then travelled and had Communion at Abu-gosh (Emmaus 3), finally ending our pilgrimage at “The Lady of the Ark of the Covenant” church, where the Ark of the Covenant was based for 20-60 years. This has been a full and enriching pilgrimage with many deep cultural aspects of the Gospel revealed in-situ, and I have no hesitation in recommending St George’s College of Jerusalem courses to fellow New Zealanders, and to all nations who speak English. 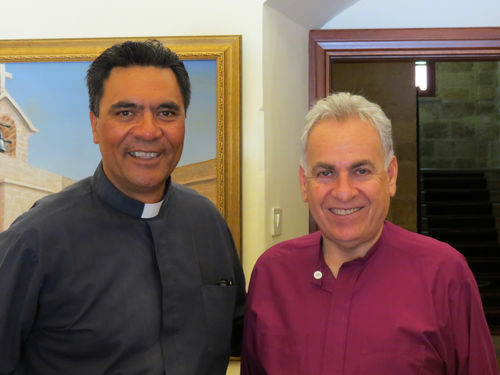 Photo: Canon Kereopa and Bishop Suheil meet on the 29 June 2012.